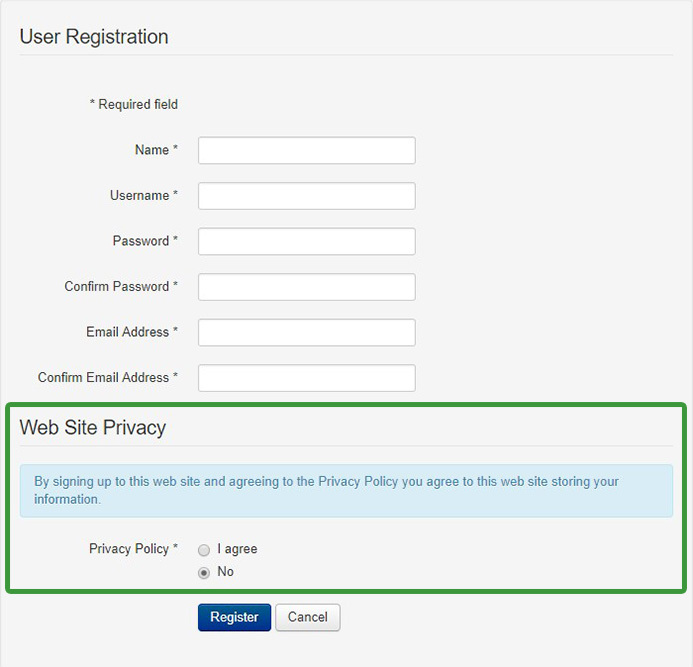 Privacy - User Accounts: The plugin is used to send privacy requests for Joomla user accounts. Privacy - Contacts: The plugin is used to send privacy requests for Joomla contact data. Privacy - Content: The plugin is used to handle the privacy data for Joomla content. 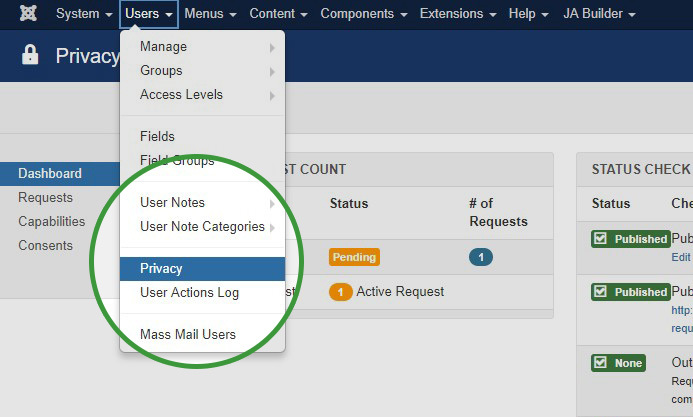 Privacy - User Messages: The plugin is used to handle the user message privacy data of Joomla users. Privacy - Consents: This plugin is used to handle privacy requests for Joomla consent privacy. Privacy Article: Select an article that contains privacy details. 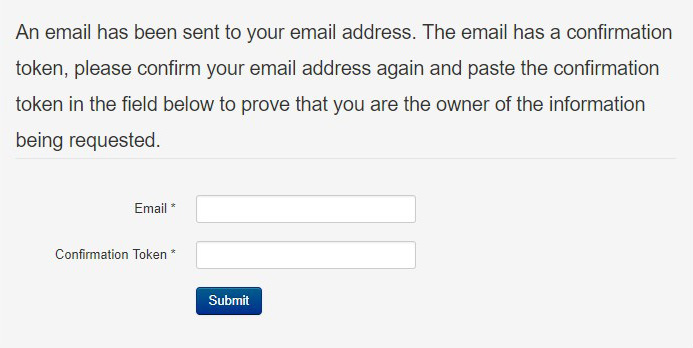 Redirect Message: A Custom message display on registration page redirection. Expiration: This tab contains the expiration settings for the consent form. Periodic check: Checks expiration of consent. Expiration: Allow to configure no. of days for privacy consent shell. Remind: Send a reminder users for expiring consent. 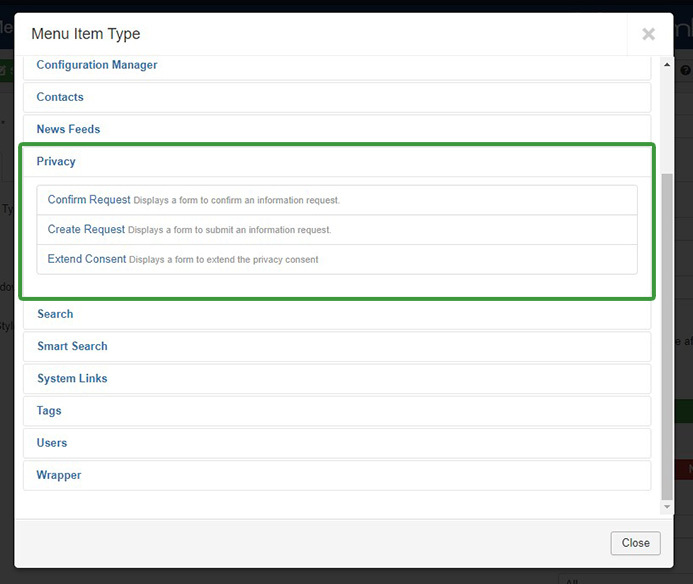 Once the plugin is configured you will see the consent checkbox in Joomla registration form. Confirm Request:	Displays a form to confirm an information request. Create Request: Displays a form to submit an information request. You must logged in on site to create a request. All Request are added in the privacy dashboard. Admin can take action on the request from Privacy > Requests. 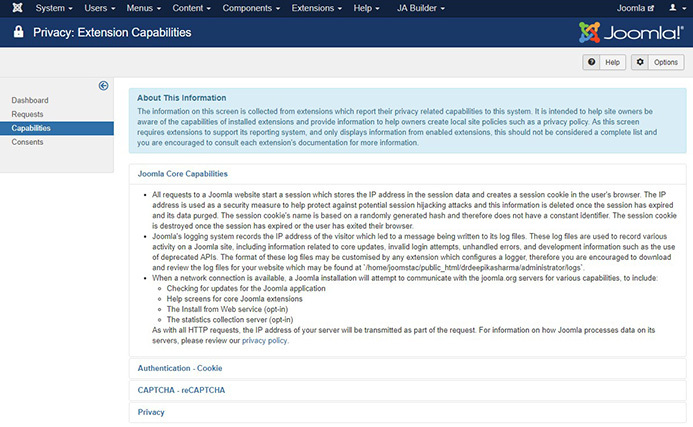 Joomla 3.9 comes with API support for 3rd party extensions. It allow extension developers to integrate the extension with Joomla Privacy suit. The extension will collect the data and share it with privacy suite to handle the request. Here is complete guide on Joomla forum for this integration.